The Extrufood cooking extruder is a twin-screw, counter-rotating extruder, specifically designed for the production of low shear confectionery recipes such as licorice, fruit gums, fruits snacks, caramels, and hard candies. 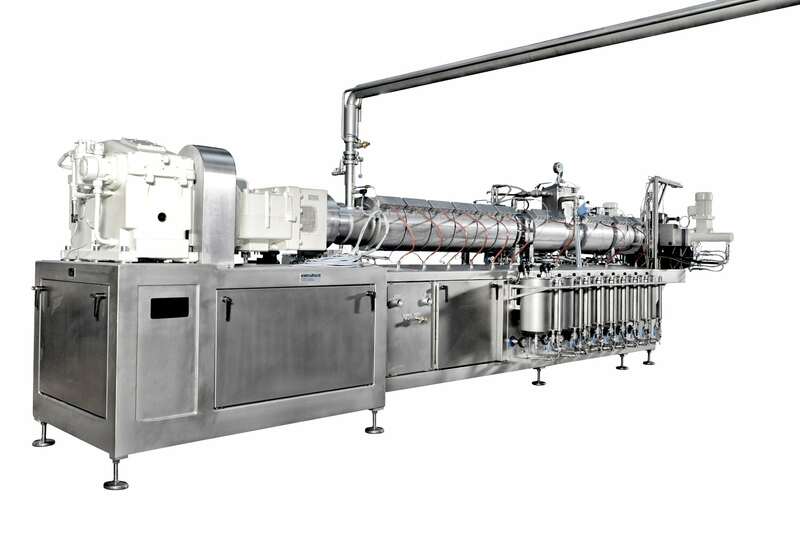 The machine consists of a stainless steel base frame which supports the gearbox, electrical drive, extruder, de-areation, tempering, color and flavor dosing, and screen changer. The cylinder consists of two components, a cooking zone and a vacuum/cooling zone, and is tempered by water. During start up the extruder is heated electrically. After the set temperature has been reached, the slurry is fed into the extruder in preparation for it to be cooked. The internal friction in the pre-mix slurry, caused by the extruder screws, actually generates heat by itself; decreasing the need for additional electrical energy, enabling it to drop to 30 – 40 % of the initial level! The combination of the external energy and the internal friction inside the cylinder, results in an efficient cooking process and is the main reason for the superior quality product produced by an Extrufood line. The barrel and screws can be dismounted and taken away for inspection and maintenance without having to move the extruder out of the line. The control system is based on either a Siemens or Allan Bradley control unit. Furthermore, our extruder is completely wired to a single connection point, which makes for easy and fast installation. We have supplied more than 50 cooking extruders to many leading confectionery manufacturers, providing them with excellent results.